palm springs modernism week 2014: dragnet house -- the story you are about to see is true . . . Dragnet opening line! This house, which was part of the Palm Springs Modernism Week 2014 Signature Home Tour in February, was built by Jack Webb, most famous for his role as Sargent Joe Friday in the 1950s radio show and the 1960s television series. I really do enjoy trolling online, retail and flea market venues for mid-century modern collectibles. So, if I may self-proclaim — I am becoming somewhat of an aficionado. with opinions. Like this chair? Absolutely beautiful laser cut plywood and pretty typical of what you uncover at Modernica's Downtown Modernism spring event. 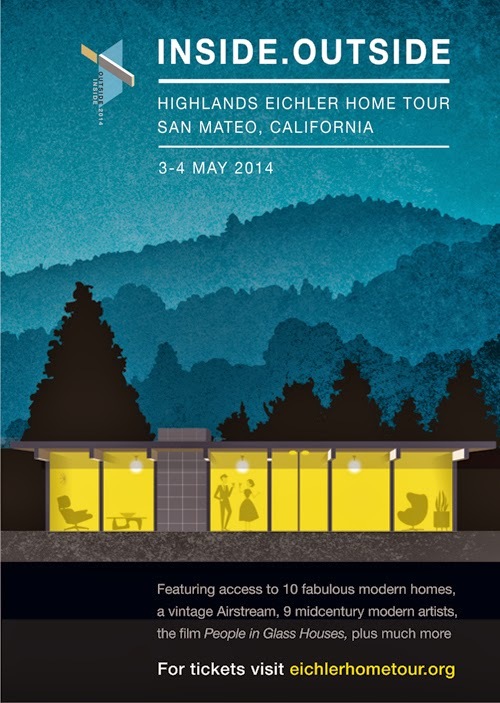 I may just hop up to San Mateo, California on May 3-4, 2014 for the Inside Outside Highlands Eichler Home Tour. All my favorite things: art, decorating, landscaping and Eichlers. Back to our regularly schedule programming, although I did really enjoy the Eichler distraction. Let's jump from 1962 all the way to 2006. On the Palm Springs Modernism Week 2014 Signature Homes tour back in February, I was disappointed perusing the brochure that one of the homes included was nearly brand new. What a travesty! Alright, alright. So I was wrong. Not the first time.